Hear that? It’s the sound of a UAS (unmanned aircraft system), also known as a small UAS (sUAS) or drone and defined by the Federal Aviation Administration (FAA) as “an aircraft without a human pilot onboard”. But wait – should that UAS be flying over a group of people? Or over a stadium? Or near other aircraft? In these cases and others of unauthorized flight , national and individual security is at risk. No matter what the intent or circumstances are, countering unauthorized UAS is of utmost importance and requires bringing down the drone quickly and safely. There are a variety of commercial counter-UAS (C-UAS) systems technologies, such as acoustic sensors, radars, physical nets, daytime cameras, thermal cameras, radio frequency (RF) jammers, and cyber-attacks, but how well do they actually perform against UAS? And how can the U.S. government harness these solutions to ensure safety and security? Cue the MITRE Challenge, Countering Unauthorized Unmanned Aircraft Systems. On November 9, 2015, MITRE launched this challenge to quantitatively assess C-UAS systems and “bring together government and industry to talk tactics, technology, and requirements for domestic, urban, base-defense against sUAS” . In doing do, Technology Integrator Dr. Michael Balazs, one of the co-leads of the Challenge, with Lead Sensors Systems Engineer Jonathan Rotner, explains, “Our goal is to help the government and MITRE to better understand the state of technologies that could be deployed across the United States and in foreign urban environments” . MITRE received 42 submissions from six different countries from various independent entrants, universities, small/medium companies, and large companies. On August 10, 2016, eight finalists and one academic team geared up at the Marine Corps Base in Quantico, Virginia for eight days of participating in live flight assessments of the systems. MITRE flew small UAS against the participant teams, presenting them with different scenarios that grew in complexity. Teams were then scored on how quickly and accurately they could identify threats and how safely they brought the threats down. Teams could compete in three categories: Detection and Determination (D&D), Interdiction (i.e., bringing down the UAS), and End to End system (E2E). On September 8, 2016, two winners emerged among the three categories: DroneRANGER of Van Cleve and Associates in Alexandria, Virginia for D&D and E2E, and SkyWall 100 of Open Works Engineering from Riding Mill, England for Interdiction. DroneRANGER used radars and RF jammers, while SkyWall 100 used compressed air-powered launchers and intelligent projectiles. After the challenge, all teams presented their technologies to a government audience. There were also additional question-and-answer sessions and debriefing sessions for observers, competitors, and government representatives. As a result, industry and government were better able to understand each other’s requirements and technologies, discuss how technology could be improved, and make recommendations for the future of C-UAS. And the future may be the ultimate challenge. The market for UAS is rapidly proliferating and evolving in response to global demand, and there is no technological silver bullet that can counter all UAS threats all the time. In the two years of devising, executing, and learning from this event, MITRE has developed a set of key takeaways and recommendations that we’re sharing amidst the UAS community. For example, one of the takeaways was that only small changes (e.g., changing a password, or attacking from multiple directions simultaneously), could defeat most C-UAS systems that were tested. As a recommendation, sponsors engaging in C-UAS should conduct realistic exercises, introduce unknown-beforehand threats, debrief the C-UAS teams, and allow time for government-industry conversations. 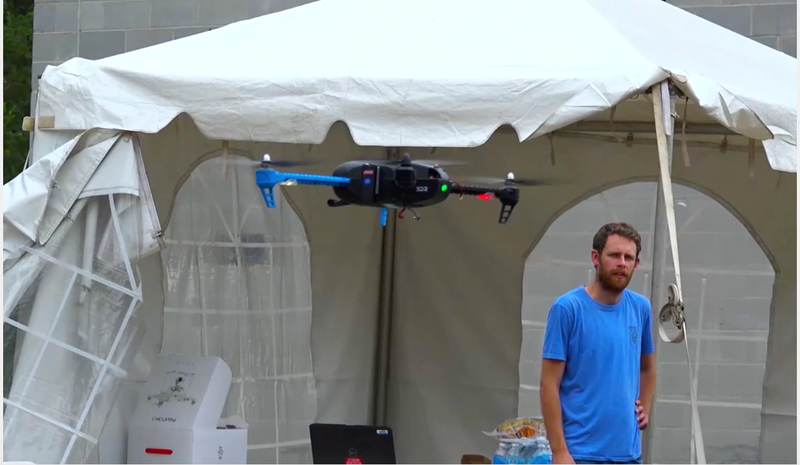 The MITRE Challenge served as a catalyst for the C-UAS community, bringing together government, military, vendors, and academia to test and evaluate cutting edge technology in the real world. Now with an engaged community, it is possible to find even more resilient solutions that will ensure national security. Amanda Andrei is a group leader and computational social scientist in the Department of Cognitive Sciences and Artificial Intelligence at MITRE. She specializes in social media analysis, designing innovative spaces, and writing articles on cool events. Balazs, M., Hobbs, B., Rotner, J., & Sward, R. (2017). The MITRE Challenge: Countering Unauthorized Unmanned Aircraft Systems. The MITRE Corporation. Mclean, VA.
 Wood, Beverly. “Winners of MITRE’s Countering UAS Challenge Announced.” MITRE News Center, 8 Sept 2016. Wood, Beverly. “The Countering UAS Challenge Garners Praise from Competitors and Sponsors.” MITRE News Center, 23 Aug 2016. The views are those of the author, not the The MITRE Corporation or the government. The MITRE Corporation is a not-for-profit organization that operates research and development centers sponsored by the federal government. Learn more about MITRE.